Volvo’s XC90 made its first ever appearance in the year 2003 and it hasn’t undergone any major changes since then. Yet. For the year 2015, the Volvo XC90 will go under the knife for good as the automakers plan to redesign it in all ways possible. Today, when each and every model usually gets an update in about five years or so, the Volvo XC90 remain unchanged for about ten years and it was high time that the brand thought about buffing it up for the new age SUV lovers. The major reasons to stick to the good old design of the Volvo XC90 were safety and minimalistic design, which is signature for the brand. However, due to a rapid advancement in design and performance of its competitors, the redesign became crucial to the 2015 Volvo XC90. There has been no official unveiling of the exact redesigned skin for the 2015 Volvo XC90. But there have been guesses and anticipation. 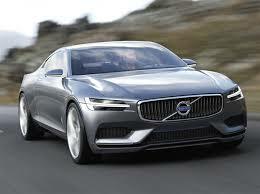 Many are considering the XC Coupe Concept as a foretaste for the design of the XC90 SUV. After all, there’s only a little difference. A coupe has two doors while an SUV has four along with more seats. Imagining the 2015 Volvo XC90 is easy. An erect grille, extended hood and a broadened rear with newly designed taillamps is what that should be seriously included into the design of the 2015 Volvo XC90 to make it look more defined and aggressive. As a matter of fact, along with a completely redesigned front fascia and rear, the 2015 Volvo XC90 will be underpinned by a new platform which is anticipated to reduce the weight of the SUV dramatically. The all new 2015 Volvo XC90 will be powered by a 2.0 liter turbocharged four cylinder engine mated with an eight speed automatic transmission. While there are not much precise details about the trim levels and other powertrains, there is news that the upper trims could feature more powerful engines making up to 300 ponies. Another big news associated with the release of the 2015 Volvo XC90 is that there is a great possibility of Volvo knocking down the Mitsubishi’s soon to release Outlander Plug-In Hybrid, by launching the XC90 PHEV in the summer of 2015. This PHEV model is likely to feature the similar 2.0 liter turbocharged, direct injected engine along with two electric motors to offer both front-wheel and all wheel drives. This, again, is expected to produce about 300 horses of power. The safety features get enhanced for the model year 2015 as the Volvo XC90 could possible feature night-time pedestrian detection, adaptive cruise control, steering assist and correction and collision protection along with the already present amazing safety features. The 2015 Volvo XC90 is most likely to set the roads on fire in the wake of the year 2015. The starting price is estimated to be about $42,000. While it faces tough competition with models like the Acura MDX and GMC Acadia which are family SUVs at a more affordable price, the Volvo XC90 would surely be a hit! 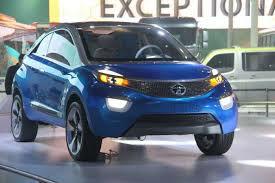 Tata Motors Reveals Its New Nexon SUV Concept! The developing nation of India promises huge potentials in every industry related field, and the automobile industry is no far behind! The country’s appetite for crossover SUVs has grown many folds during the last few years, with numerous major car makers like BMW, Audi, Renault, Ford, etc. introducing their respective models in the market and earning out huge profits. However, the nation’s very own leading automaker, Tata Motors has now decided to enter the sector as well! The largely successful company revealed its new Nexon Crossover SUV Concept at the 2014 Auto Expo that was organised in the country’s capital city. The company, working on its oath to present the country with two new vehicles every year, had also unveiled two more concepts at the event – the Tata Bolt and the Tata Zest. The Tata Nexon Concept has been precisely aimed to compete against the Ford EcoSport and the Renault Duster SUVs, which have currently occupied large proportions of the SUV market of the country. Also, India’s other major automobile company, Maruti, has planned to launch a SUV in the crossover segment as well. The Nexon SUV will be known by the name Maruti XA Alpha. The Nexon SUV concept that was unveiled at the 2014 Auto Expo was quite fancy and impressive! The company revealed the vehicle with scissor doors as well as floating seats. The exterior was painted a bright blue, and the interiors featured a neon blue touch throughout’ imparting a futuristic touch to the Nexon SUV. However, the production model of the SUV will be very much different from the one mentioned above. Unfortunately, the amazing floating seats will not be present in the production model, nor will be the scissor doors. 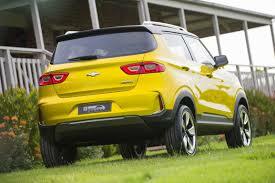 The company also stated that the exteriors of the cars are also largely tentative. However, there might be no or very slight changes to the dimensions of the vehicle, which means that the car would stay a crossover only. The vehicle is currently 4 metres long, 1.6 metres tall and 1.73 metres wide. The body is built on the X1 platform, with a wheel base of 2.54 metres. Under the hood, the Nexon SUV features a 3 cylinder 1200cc engine powered by petrol. The engine will be fed a turbocharged fuel mixture, enabling it to churn out a total of 110 PS of maximum power and 170 Nm of torque. The Nexon SUV will offer a 5 speed automatic transmission system and the vehicle will deliver an impressive fuel economy of over 17.5 kilometres per litre! The company showcased the Nexon SUV with a 17 inch wheel set. However, it is being said that the vehicle will come with a 16 inch wheel set after production. As far as customization options are considered, the company said that the Nexon SUV will feature a very wide array of customizable features, the most notable one being the option of including an electric four wheel drive system. So far, the concept promises a lot! After the Mahindra XUV 500 has been exported to various foreign markets, let’s see how this Indian SUV fares! In the world of the futuristic concept automobiles, one can find many innovative and creative ideas in the crossover SUV field as well. From unique exterior looks to innovative features or performance systems, you will find them all. However, the well reputed French automobile giant, Renault, decided to step things up a notch. 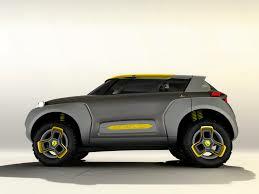 The consequent result of this decision was the Renault Kwid SUV Concept. As we dug deeper into the features and the looks of the SUV, we quickly concluded that the SUV will target young customers looking for fancy and aggressive rides, combining style and technology together. Worthy of mentioning, the Renault Kwid features so many of unique technical features and looks that it definitely looks like a new generation revolutionary vehicle. Some might even go as far as calling the design of the vehicle impractical. But hey! Even the airplane model made by the Wright Brothers back in history was called impractical, wasn’t it? Look at the exteriors of Renault Kwid and you will notice an aggressive looking sturdy design which at the same time, looks extremely futuristic. To top it all, the company revealed the model with a steel finish, accompanied by shiny yellow touches here and there. The front grill is also painted yellow. It might sound quite awkward but wait till you get a look at the thing! The vehicle looks really mighty and yes, futuristic. Now if you thought the exteriors were a bit too much, wait till we introduce you to the interiors. The vehicle features a completely new and opposite interior layout as compared to the modern cars. There is a space for three passengers in the front while two in the rear. Another very strange thing about the interiors is the fact that the driver sits in the centre of the car, while the two front passengers sit in the sides, turned a bit away to the outwards so as to keep the interference with the driver controls to a minimum. Also, the looks of the interiors of the car suggest that Spiderman might have practiced his targeting skills there, as the entire space is covered by thick band like designs. And if you thought that Renault is done with this, then you’re wrong. The most impressive and daring feature that comes with the car is a quad copter. Yes, you read it right. A drone. The SUV comes with a drone, which can be controlled wirelessly with the help of a tablet device, which also comes with the car itself. Now if you get stuck in a jam, just take your badass quad copter out and fly around to see what’s going on ahead! Getting under the hood, we found a 1200cc engine powered by petrol and turbocharged with the help of a turbocharger. The engine of Renault Kwid will be mated to a dual clutch transmission system, adding to the uniqueness of the car. Further features include high tech stuff like electrically controlled doors, touchscreen controlled gear shifting (with the help of a screen placed by the steering wheel), etc. With such unique innovations, the Renault Kwid might now really face any stiff competition. But, will it be practical enough to attract buyers? Honda’s New Vision XS – 1 SUV Replaces Vezel! The 2014 Auto Expo held in India a few weeks earlier saw a very large number of new cars and vehicles line up for display. Many companies of all statures brought their vehicles to the event and flaunted them to the Indian markets. Most of them, of course, had the Indian market on their minds while they were planning to bring their models here. 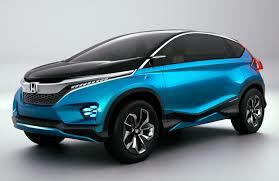 One of these well planned models at the 2014 Auto Expo was the Honda Vision XS – 1 Crossover SUV concept. The SUV has been well planned for the Indian markets and roads, and also features some of the most modern accessories and features of the SUV World. One thing to note about the Honda Vision XS – 1 concept is that although it is quite small and compact, it features a capacity to carry seven passengers at one time. Yes, it features a third row of seats as well! The concept SUV is very literally a living proof of Ford’s capabilities to fit in all that a local market requires in an appropriate amount of compact space. However, contrary to what one may assume, the interior space of the vehicle appears to be quite spacious and comfortable! The Honda Vision XS – 1 is quite largely compared to one of the company’s previous compact suv concepts, the Honda Vezel. The Vezel concept SUV was not received very well by SUV lovers as critics. However, the Honda Vision XS – 1 concept is clearly a much more emphatic version of the Vezel concept SUV. As far as the looks of the Honda Vision XS – 1 are considered, it can be said to be a much sportier version of the previous Vezel SUV concept. It will be quite worthy of mentioning that the Honda Vezel concept was unveiled at the Tokyo Auto Salon, and might soon be seen riding the streets of the United States of America. The technical specifications and features of the car are pretty much unknown to the outside world as the company decided to keep these details to themselves for a while. But as far as the build of the vehicle is considered, one can expect an in line 4 cylinder engines, with a displacement of around 1400cc. The engine would most probably produce a power of around 140 Horse Power and a torque of over 120 Nm. Acceleration statstics of the vehicle are expected to show that it will be capable of going form rest to a speed of 62 miles per hour (100 kilometres per hour) in 10.5 seconds, which is fairly good for a SUV like this one. The top speed is expected to be 120 miles per hour (193 kilometres per hour). One of the unique things about the car is its doors. The SUV features sliding doors, which are seen only in vans so far. Also, Honda stated quite clearly that the Honda Vision XS – 1 will feature the new “Exciting H Design!! !” that the company recently introduced. The three exclamation marks in the name stand for ‘High Tech’, ‘High Tension’ and ‘High Touch’. At the 2014 Indian Auto Expo, one of the big names in the industry, Chevrolet revealed an all new compact SUV concept with the moniker Adra. Styling cues from the MINI Countryman are amazingly prominent in the design of this new SUV concept which was both conceptualized and materialized solely in India. However, the design is truly international. The lines and contours, the body of the Chevrolet Adra Concept speaks of the brands worldwide design appeal. While the parent brand, General Motors has not made any official statements about the new Adra Concept making it to production, the concept, the first look was enough to grab a lot of attention at the auto expo. There are no precise numbers and specification available about the 2014 Chevrolet Adra Concept as yet, but this concept can be taken as a fine way to showcase impressive abilities of the Indian Technical Centre of General Motors to develop something essentially indigenous to India yet truly international in its approach. GM was yet to enter the market for compact SUVs in India for there has been a dramatically tremendous growth in this niche. And, it couldn’t have got any better than the Adra Concept. The Indian Auto Expo, 2014 also brought with itself a newly refurbished Chevrolet Beat. What was most apparent at the moment it was unveiled was the amazing front grille. The new grille of the 2014 Chevrolet Beat is hands down a showstopper. It is bold and it is stylish. The front grille is accompanied by new headlights. These crystal clear headlights are lens based and look even more prominent with the black accent around them. Even the foglights get a new housing. The big show is not just about the front façade of the car. As a matter of fact, the rear of the 2014 Chevrolet Beat has also been worked upon with revamped taillights and an LED inserted, stylish spoiler. The interior of the 2014 Chevrolet Beat has also been renewed. Besides the new accents in the tone of silver that brighten up the insides, the new Beat also sports a vertically adjustable driver’s seat in all base models. The higher trim levels are set to feature steering mounted audio controls. For people to have no regrets about having not enough options, the automaker will release the 2014 Chevrolet Beat in ten trim levels out of which four will be petrol powered, two will run on Petrol-LPG and the remaining four will be diesel powered. The powertrain of the Beat sees no change for the new model year, which simply translates to an availability of a 1.0 liter three cylinder diesel engine, good for 59 PS and a 1.2 liter petrol motor capable of supplying 80 PS to the vehicle. Chevrolet made quite an appearance the 2014 Indian Auto Expo with the Adra Concept making the most news, followed by the newly done Beat. Alongside, there were the Chevrolet C7 Corvette, the Chevrolet Trailblazer and the Chevrolet Camaro on display. As the market bids adieu to the Toyota FJ Cruiser this year, the automaker is set to bid adieu back by releasing a special edition of the FJ Cruiser. The 2014 Toyota FJ Cruiser will be an off roader at its heart. This Ultimate Edition of the Cruiser will be limited, translating to only 2,500 vehicles of the type. Dipped in the hue of Heritage Blue, this limited edition of the Toyota FJ Cruiser will feature a color matched roof as well. Toyota has been an automaker known well for its safe playing, incorporating more conventional designs in its releases. In a scenario like that, the Toyota FJ Cruiser is an oddity, and a nice one. The FJ Cruiser is a funky coupe that still proudly boasts the retro and quirky styling even after eight years since its debut. And don’t let that fun styling fool you. The emblematic styling of the Toyota FJ Cruiser conceals some amazing off road potential. This makes the 2014 Toyota FJ Cruiser an amazingly uncommon vehicle, not just among all the other Toyotas but also among all the SUVs in the market. It is extremely sad to watch such a wonderful vehicle leave. 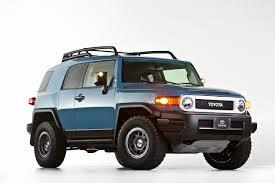 The 2014 Toyota FJ Cruiser boasts a 4.0 liter V6 engine that is good for 260 ponies and 271 pound feet of twist. The standard FJ Cruiser comes with a five speed automatic transmission coupled with a rear wheel drive. The all wheel drive systems come in two options. While one is a four wheel drive system clubbed to the five speed automatic, the other is a full time all four wheel drive system coupled with a six speed automatic transmission along with a rear locking differential. There are no trim levels for the 2014 Toyota FJ Cruiser. This unique vehicle remains unique in every possible sense. The five passenger vehicle cruises on 17 inch steel wheels. Taller than the conventional five seater SUVs, the 2014 Toyota FJ Cruises looks interesting due to its distinctive doors. In its very modest modeling, the Toyota FJ Cruiser sports full power accessories along with every other feature one could ever need. The Infotainment system of the 2014 Toyota FJ Cruiser is also an impressive collection of features. The additional features, according to one’s need, can be availed in form of packages. There is the Convenience package that adds features like enhanced traction control, leather covered steering wheel and an 11 speaker JBL surround sound system. An option of 16 inch alloy wheels also prevails. The Trail Teams Ultimate Edition package will make a grand entry later this year and it will add to the FJ Cruiser, a tuned TRD suspension, especially for the model. This model would roll on 16 inch bead-lock tires that compliment the off road terrains beautifully. The Trail Teams Cruiser will be painted in Heritage Blue and will encapsulate a majority of the features from the above told packages. The 2014 Toyota FJ Cruiser seems to have gotten the best it could be. While the news of a such a vehicle taking retirement, left many SUV lovers crestfallen, the fact that it leaves with a bang, is a happy note to say goodbye on. Yet again Audi managed to turn eyes at the 2014 Detroit Auto Show. Among the few automakers, which all the eyes look forward to, Audi unleashed a new concept of a mini crossover this year. Apparently, the smallest crossover from the brand, the Audi Allroad Shooting Brake Concept is another futuristic attempt by Audi. The concept employs a plug in gas electric hybrid powertrain into an avant-garde crossover that is both compact and sporty. What seem much apparent from the styling are the cues taken from the 2014 Audi Allroad as well as the sporty Audi TT, henceforth, making the 2014 Audi Allroad Shooting Brake concept look like a tall wagon with two doors. And that is where the moniker comes from! As it is said that this is probably the smallest crossover proposed by the brand, the 2014 Audi Allroad Shooting Brake concept car is even smaller than the 2015 Audi Q3. The futuristic wagon is powered by a 2.0 liter turbocharged inline four cylinder engine with direct injection. The engine readily delivers 288 horsepower and 280 pound feet of twist. The gasoline grunt is coupled with two electric motors. The front drive motor is rated at 40 kilowatts while the one fitted on the rear axle is rated at 85 kilowatts. The motor responsible for rear drive is separated from the main drivetrain of the vehicle. 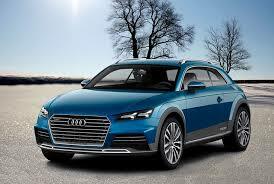 The 2014 Audi Allroad Shooting Brake concept runs on an 8.8 kilowatt-hour lithium ion battery. When the motor comes into action, the 2014 Audi Allroad Shooting Brake concept drives with power of 402 ponies and whopping 479 pound feet of torque. That is some serious amount of twist for a vehicle that small! The transmission that is mated to the amazing engine of the concept is a six speed dual clutch automated manual transmission, which accelerates the 2014 Audi Allroad Shooting Brake concept from rest to 760 mph in a sprint time of just 4.6 seconds. Another impressive number in line! The top speed that the vehicle can attain, as the brand claims, is 155 mph. Molecules of Aluminum and carbon fiber have come together to materialize this concept car. The use of such materials reduces the weight of the wagon, dramatically. A much needed attribute! However, the carbon fiber could spike up the cost of the vehicle, if it hits production. On the inside, the 2014 Audi Allroad Shooting Brake Concept boasts the advanced most edition of the Audi’s Multi Media Interface. Major features that come with the MMI are 3D graphics on your panel screen and an option to inductively charge your smartphone by linking it to the wagon’s electrical system. The 2014 Audi Allroad Shooting Brake, for all intents and purposes, was a concept car. A vehicle, strictly same as this, would never be available for you to buy. However, the brand will most likely inculcate elements from the design into the upcoming models. Being such a compact crossover, and that too with two doors, the chances of something like the 2014 Audi Allroad Shooting Brake to be available in the US are thin. While there is a fair share of customers who would drool over the crossovers that are in rage today, there still remain a whole lot of customers that would never compromise with their tastes for a conventional truck-like SUV. There is a sort of old world charm about these humungous vehicles, their strength like Hercules, to tow up a million pounds and their amazing capacity to seat a fair number of passengers. No crossover, no matter how big, can provide the same essence of a traditional SUV. The Toyota Sequoia is one such traditional SUV. Built on an enhanced version of the platform that underpins the Toyota Tundra, the 2014 Toyota Sequoia is a perfect blend of power and sophistication. The eight-seater is powered by a 5.7 liter V8 engine. The grunt produces about 381 ponies which is a fine amount of power for a vehicle this size, along with 401 pound feet of torque. The transmission mated to the engine of the 2014 Toyota Sequoia is a six speed automatic, coupled to a rear wheel drive. Since the SUV is truck-based, an available four wheel drive model with low range gearing is somewhat like a protocol. The monstrous SUV takes a sprint time of merely 6.7 seconds to accelerate from rest to 60 mph, which is pretty quick for a vehicle in this niche. The fuel economy for a rear wheel drive model is rated at 15 mpg combine, and that for all wheel drive is 14 mpg combined, sadly low. The 2014 Toyota Sequoia offers its driver with an impressive and vigorous acceleration and its engine drives amazingly smooth, to a lot of people’s surprise. The beast carries strength to tow up to a whopping 7,400 pounds. The handling is fine and the ride, comfortable. The comfort that the SUV offers doesn’t come from just the ride quality it sports, but also from the spacious cabin and the seating inside the vehicle that is as roomy as to comfortably accommodate eight passengers. Available in three trim levels viz. the SR5, Limited and Platinum, the 2014 Toyota Sequoia comes fairly well equipped even at the base level. As the luxury quotient of the SUV rises up, in all its glory, a 2014 Toyota Sequoia offers features and comfort that are comparable to a lot of luxury sedans. The interiors sport fine quality material and elegant styling, thus balancing the truck based genesis of the SUV. The infotainment system has been upgraded for this model year and that remains the only change in the 2014 Toyota Sequoia as compared to the last model year. For those who don’t feel much need of a vehicle as heavy duty as a 2014 Toyota Sequoia, there are other options available in the market, such as the 2014 Chevrolet Traverse, which too, is a three row crossover. Or if you look for a vehicle even more powerful that the Sequoia, the 2014 Infiniti QX80 is more beastly, more luxurious and more athletic. 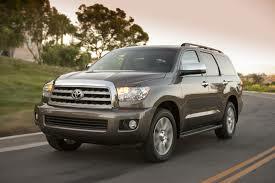 However, the 2014 Toyota Sequoia is a perfect choice for old school SUV lovers. Usually, the SUVs these days don’t combine the utility part and sports part in a vehicle as much as they should. More, often than not, it is either of the two! And due to the “sports” part lacking a bit more than the utilities, most of the times we end up with SUVs that are amazing on roaders but not so impressive off roaders. Toyota, however, seems to be on spree of making vehicle that are just as amazing off roaders along with impressive styling and utility. One such SUV is 2014 Toyota 4Runner. The 2014 Toyota 4Runner is an off roader, essentially. The good old body on frame architecture of the SUV implies the same. The suspension in this midsized SUV is such that, no matter how rough of a terrain you choose to test it, the SUV, and you, will come out whole and alive. Cruising on a four wheel drive, featuring low range gearing along with an option rear locking differential almost makes the 2014 Toyota FJ Cruiser almost glide through challenging terrains. The 2014 Toyota 4Runner is powered by a 4.0 liter V6 grunt which effectively supplies about 270 horsepower and produces 278 pound feet of torque. Along with that engine, which is standard, comes the standard five speed automatic transmission. The 4Runner comes in three trim levels, namely, the SR5, Trail and Limited. The SR5 is the standard Toyota 4Runner with the above mentioned powertrain. The Limited Toyota 4Runner has an available rear wheel drive along with the four wheel drive, while the Trail’s engine is coupled only to a four wheel drive system. The 2014 Toyota 4Runner, in all its glory, can manage to tow a whopping 4,700 pounds. Impressive for a vehicle this size! A 2014 Toyota 4Runner SR5 running on a rear wheel drive is capable of reaching 60 mph from rest in a sprint time of 7.2 seconds, while a 2014 Toyota 4Runner Trail equipped with a four wheel drive takes 8.2 seconds. The fuel economy of the rear wheel drive models rate at 19 mpg combined, while that for four wheel drives rates at 18 mpg combined. The numbers are not as impressive as they should be, considering the fact that the 2014 Toyota 4Runner is an off road centered SUV with a V6 that runs on gas. While most of the SUVs feature driving dynamics good for finely paved roads, the 2014 Toyota 4Runner lives for the rugged terrains. While the SUV is capable of driving anyone to work in an easy and comfortable ride, it is also capable of making you slide through severe crests and troughs without even a hint of bounciness. The vehicle’s transmission provides precise shifts as well. 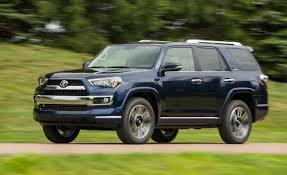 The 2014 Toyota 4Runner is an off roader in essence. One of the toughest rivals to the 4Runner is the 2014 Jeep Grand Cherokee but the 2014 Toyota 4Runners takes it away with an available third row of seats and a better cargo capacity. Other rivals include the 2014 Dodge Durango and the 2014 Volkswagen Touareg. Crossovers are supposed to be a homogeneous blend of car-like styling and SUV-like utilities. Lord knows there have been such false crossovers which are either cars in their roots or bulky truck like SUVs. One of the either styling they carry, that is! But, Subaru has always been a brand with a fine hand at developing crossovers that have just the right amount of styling with equal amount of utility. The Outback lineup from the automaker is a perfect example of juts that. And then there is the comparatively new lineup Crosstrek! Every Crosstrek is basically a Subaru Impreza, which is a hatchback. To turn it into a fine crossover, the brand poured into the wagon, some hard-edged styling along with an enhanced suspension. The all wheel drive crossover is one of the most proficient vehicles in its niche. 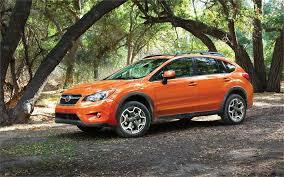 The 2014 Subaru XV Crosstrek steps almost unchanged into the year besides a new addition to the lineup. The 2014 Crosstrek lineup would be welcoming a hybrid version of the vehicle. Other additions for the year include a smartphone integration system. The five-seater comes in various trim levels. There is the 2014 Subaru XV Crosstrek 2.0i Premium for starters followed by the 2.0i Limited, and then there are the Hybrid and Hybrid Touring trims of the vehicle. The basic 2014 Subaru XV Crosstrek is powered by a 2.0 liter four cylinder engine which readily produces 148 horses and 145pound feet of twist. This 2,0i Premium comes standard with a five speed manual transmission along with an all wheel drive system. While it comes as an available option on the Premium trim, the 2.0i Limited trim features a CVT as standard, which is also mated to an all wheel drive system, however, different from the AWD of the Premium. The newest to the lineup, the 2014 Subaru XV Crosstrek Hybrid boasts a similar engine mated to a CVT along with an all wheel drive, and, clubs it all with an electric motor which adds another 13 ponies and 48 pound feet to the original numbers. A regular 2014 Subaru XV Crosstrek, featuring a CVT, accelerates to 60 mph from rest in a sprint time of 9.9 seconds. On par with the performance of the new Outlander Sport and lesser than that of the 2014 Nissan Juke, the numbers do fine for the 2014 Crosstrek. On the inside, the 2014 Subaru XV Crosstrek is a sophisticated little vehicle with understated yet chic designing. The presentation of the dials and gauges on the dashboard are kept simple and elegant, adding to the simplistic overall styling of the interiors. However, the infotainment system and sound system in the crossover are amazingly depressing. The fuel economy of the 2014 Subaru XV Crosstrek is pretty impressive. However, the transmission that yields to the same, sadly also yields to delayed responses as well as noise. The crossover faces quite some competition with models like the Juke, the Outlander Sport and the Mini Cooper Countryman, but the Crosstrek stands as a fine vehicle in its segment.